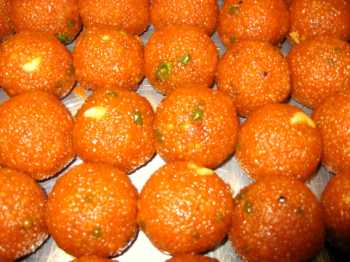 easy motichoor laddoo that can be made at home. For syrup bring sugar and water to a boil,add milk and boil till the scum rises on top. Strain the syrup and keep aside. Mix gram flour, milk and orange colour to make a smooth batter. Heat ghee in a kadai till hot. Place a perforated spoon over the kadai,pour the batter slowly in the spoon in hot ghee. Stir till lightly golden, remove and soak in an absorbent paper. Mix boondi in syrup wait till it absorbs the syrup. Spread the boondis on a plate and sprinkle hot water over it,cover for 5 mins. Now with your palms shape it in round laddoos. Yummy ladoos .Will surely giv a try. we have to sprinkle hot water so that it could be shaped in round laddoos. thnx for your comments frndz. Thanks for the recipe. Its 1 of my Fav sweet. Can you please explain why sprinkle hot water on the boondis after dipping them in syrup?